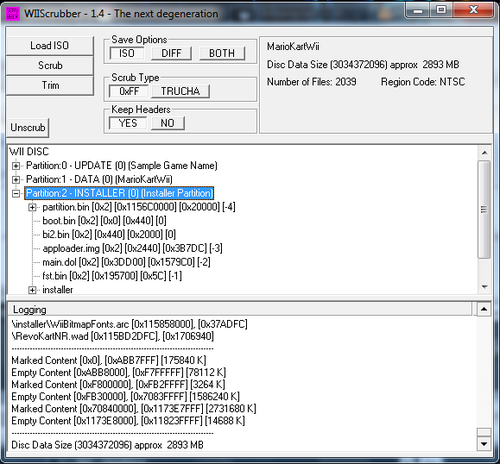 This is an updated Wiiscrubber that fixes a few bugs and adds a few features. three partitions in the primary. To paraphrase Star Wars "Many verbatims died to bring you this information"). 11.Partition titles displayed in the window. In other words you can easily create a multipartition disc. AKA a multiboot. 1. Makewiikeybin. exe - makes a key.bin file for you. Does not contain the actual key but generates it from a simple algorithm. - Decided to remove this from the pack due to some twittering. See links for possible solution - I also recommend hexd.exe. Version 1.1 also generates the Korean kkey.bin. 2. PartitionBuilder - allows you to generate a partition file that can be loaded via wiiscrubber. This means you can now generate an entire partition from a directory of files. So rather than changing one at a time you can extract an entire partition, change whatever files you want and then rebuild. 2. Shrink partition works correctly now - incorrect size was being copied down - OOOPS.